I learned how to make a peanut butter cheesecake recipe. I never could imagine this many years ago it was always white cheesecake. When I was a kid and eating those peanut butter and jelly sandwiches I never thought that it could have gotten any better. This sandwich which is part of almost every child’s life is practically an American tradition. 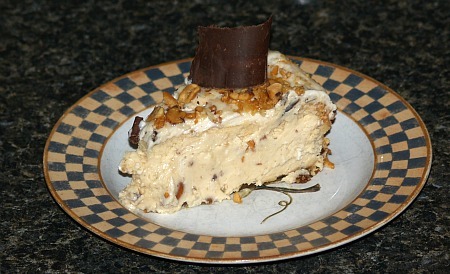 When I learned how to make a peanut butter cheesecake recipe I found there is more to this nutty butter than those wonderful sandwiches. You can now count on that creamy nutty taste in one of the world’s favorite desserts; cheesecake recipes. When I learned how to make the peanut butter cheesecake recipe I found it makes a wonderful combination of two deliciously creamy ingredients. Peanut butter can be paired with many different flavors like chocolate and banana. 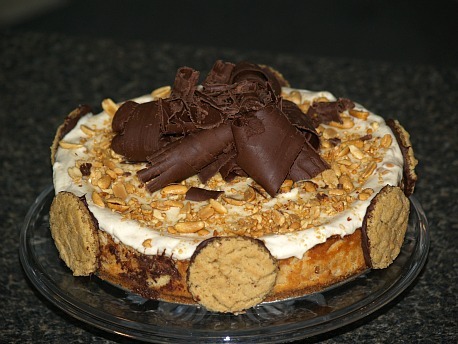 Can you imagine a banana or chocolate cheesecake with swirls of creamy peanut butter in it? Well that can be done. I love to make my own fresh peanut butter to use in recipes like this. When you learn how to make peanut butter for swirled cheesecake just make the nut butters a little thinner; drop spoonfuls on top and swirl in cake before baking. If you are baking a thick cake you might want to put some of it in the middle. You can make your own peanut butter to use in sandwiches or in any recipes like the peanut butter cheesecake recipe or other desserts. To make 1 cup of butter put 1 ½ cups of peanuts in your blender or food processor; if you want more do in batches. Peanuts with the skins on add more fiber and nutrition to the diet. Process peanuts for 1 minute turning machine off every 10 seconds until you get a thick paste. Add oil or hot water by the tablespoon to get the blending going. The more you add the thinner it will become. Be careful not to add too much because the process will cause the natural release of oils from the nuts. If you want a chunky peanut butter, make a smooth paste first, then add whole peanuts and process only until chunky. By making your own peanut butter it adds a fresher tasting and richer butter than you can buy for adding to your peanut butter cheesecake recipe. I know it is hard to imagine this luscious creamy dessert getting any better but why not go with the best. Try one of the delicious recipes below and experience the delightful flavor of uniting cream cheese and peanut butter. Enjoy the delicious flavor of this marble cheesecake; be careful not to disturb crust when running the spatula through the batter. Grease bottom and 1 ¾ inches up sides of 9 inch spring form pan with butter. Press ground peanuts on bottom and 1 ¾ inches up the sides of pan. Beat cream cheese, peanut butter, sugar, flour and vanilla in large mixing bowl until blended. Add eggs one at a time beating after each just to combine; blend in milk and divide mixture in half. Stir melted chocolate into one-half of the peanut butter cheese mixture. Gently pour half of the PLAIN filling mixture into nut lined spring form pan. Pour all the chocolate filling mixture over the plain mixture in the pan. Spoon remaining half of plain mixture on top of the chocolate mixture. Using a narrow spatula move around in batter to make a marble effect. NOTE: Be careful not to go too deep and cut into the crust. Place spring form pan on shallow pan on oven rack. Bake for 30 to 35 minutes or until cake center appears set when shaken. Remove cake from oven; cool on rack for 15 minutes. Run a thin knife around pan to loosen cake from sides; cool 30 minutes. Remove sides of pan and cool another 1 hour; cover cake and chill at least 4 hours. The sour cream in this peanut butter cheesecake recipe adds a very decadent smoothness to its taste. Combine pretzel crumbs and melted butter. 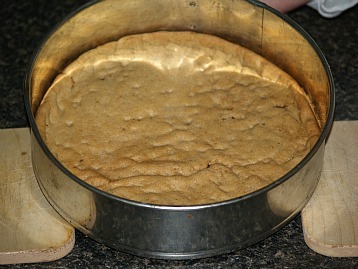 Firmly press on bottom and 1 inch up sides of 10 inch spring form pan; bake for 5 minutes. Beat cream cheese in mixing bowl on medium speed until creamy. Gradually beat in 1 ½ cups sugar; add ¾ cup peanut butter and beat well. Add eggs one at a time beating after each addition. Stir in vanilla and pour mixture into prepared pan. Bake for 40 minutes; turn off oven off and open door partially. Leave cheesecake in oven 30 minutes longer. Combine sour cream, 3 tablespoons peanut butter and ½ cup sugar stirring until sugar dissolves. Spread sour cream mixture over warm peanut butter cheesecake recipe; cool completely on wire rack. Mix cream cheese with beaten eggs; blend in peanut butter, sugar and milk. Fold in Cool Whip; turn into prepared crust. Top with chopped peanuts and chocolate curls if desired. Cover and freeze 8 hours; set at room temperature 10 to 15 minutes before cutting. Wrap bottom and sides of 10 inch spring form pan with heavy duty foil. Process cookies into fine crumbs; transfer to a small bowl. Stir ½ cup melted butter in crumbs; press in bottom of prepared pan. In a large bowl beat the cream cheese until smooth; beat in melted chips, milk and 1 teaspoon vanilla. Add eggs beating on low speed just until blended; pour into prepared crust. Place pan in another larger pan in oven; pour 1 inch hot water into larger pan. Bake 45 to 55 minutes or until center is set. Cover top with marshmallows; return to oven and bake until melted about 3 minutes. Remove the pan from the hot water; cool for 10 minutes. Remove foil from pan and loosen sides with a knife; cool another 1 hour. Combine peanut butter, corn syrup and 2 tablespoons butter in a small saucepan. Stir peanut butter mixture over low until blended. Remove from heat and stir in 1 teaspoon vanilla. Sprinkle 1 cup peanuts over cheesecake; top with peanut butter mixture and refrigerate overnight. Remove sides from pan and sprinkle remaining peanuts on top. Preheat oven to 350F degrees; place a baking pan on shelf of oven. Lightly butter 10 inch spring form pan; set aside. TO MAKE CRUST combine pretzel crumbs and butter in a small bowl. Press crumb mixture over bottom and 1 inch up sides of prepared pan. Place spring form pan on baking sheet in oven. Bake crust for 5 minutes; set on rack to cool while mixing filling. TO MAKE FILLING beat cheese and sugar in large bowl until creamy. Add the peanut butter and vanilla; mix well. Add eggs; beat on low speed just until combined. Stir in the chips and pour into the crust; return to baking sheet in oven. Bake 50 to 55 minutes until center is almost set. Remove cake from oven and let stand 15 minutes. Run a knife around edges of pan to loosen cake from sides. 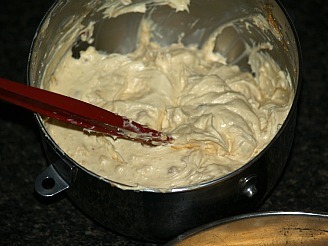 TO MAKE TOPPING combine sour cream, peanut butter and sugar in small bowl. Blend well and spread over the top of cake; sprinkle peanuts over top. Return cake to oven and bake 5 minutes longer. Cool 10 minutes; carefully run knife around the edge again. Cool to room temperature; refrigerate overnight. Remove sides of pan to serve; 12 to 14 servings. Extra crumbs and chopped peanuts for garnish if desired. TO MAKE CRUST combine crushed crackers, sugar and melted butter; blend well. Press mixture in the bottom and 1 inch sides of 9 inch spring form pan; chill. TO MAKE FILLING beat cheese and peanut butter until creamy. Add sugar to bowl; gradually add cream while beating thoroughly. Spoon mixture into cold prepared crust; garnish if desired. Refrigerate for 4 hours before serving; serves 10 to 12.